It was a pleasure to speak with Nathan Sawaya via email. 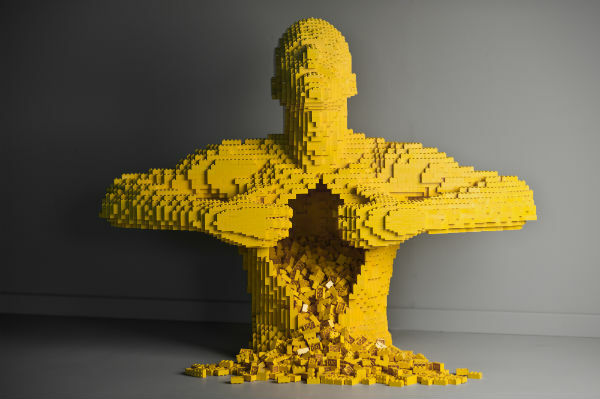 He is an incredible artist in LEGO bricks who actually makes a living with his LEGO sculptures. He has exhibits that travel the world and has written several books. 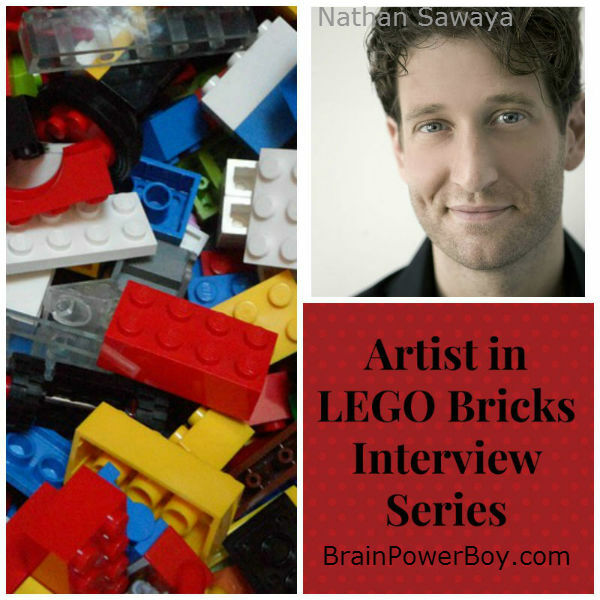 Read on to hear about what LEGO meant to him as a boy and his advice for young builders in our Interview with Nathan Sawaya. For all of our LEGO posts and to find more interviews with other builders <<< go there. 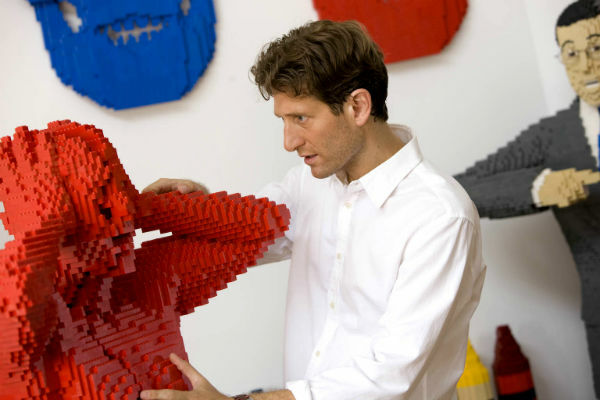 Nathan Sawaya is the next person to be interviewed for the Artist in LEGO series. He is based in New York and has been working in LEGO for a long time. His work is mainly 3D sculptures and oversized portraits. He is a full-time independent artist who used to be a corporate attorney—I can see working in LEGO as being a lot more fun. Be sure to see our posts on his book and his exhibit. Sheila: What kind of things did you enjoy playing with when you were a child? Nathan: My parents were always encouraging creativity when I was growing up, so I was often found drawing, painting or even sculpting (with Play-Doh). And of course, I had LEGO toys. I spent a great deal of time creating my own LEGO city which grew and grew. When I was ten years old I asked my parents if l could get a dog, and when they said no, I decided to build my own dog. I built a life size dog out of LEGO bricks. It was very colorful and a bit boxy, so I called it a boxer. It was an a-ha moment when I realized that I wasn’t restricted to what was on the front of the box. I could built whatever I could imagine. If l wanted to pretend to be a rock star, I could build myself guitar. If I wanted to pretend to be an astronaut, I could build myself a rocket—ship. There were no limits, and this toy would allow me to create whatever I could imagine. 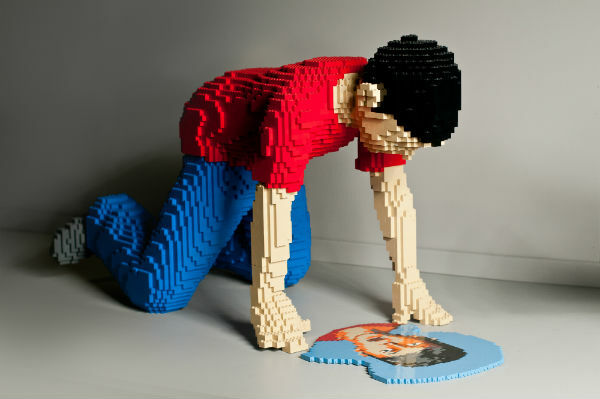 Later on in life this would lead to me using LEGO bricks as an art medium. It was the perfect art medium for me to create whatever I could imagine. Sheila: In what ways can boys continue to work with LEGO as they grow older? Nathan: There are no limits to LEGO. I have found it to be a great art medium, but there are so many ways to interact with the toy. I remember using LEGO in various science projects on such topics as engineering, physics and gravity. In college I recreated my New York neighborhood out of it in my dorm room, it was a way to decompress between classes and typical college age stresses. No matter how you use LEGO, there is no denying it will always be a universal way to play, explore and imagine, as well. Puddle by artist Nathan Sawaya. Photo courtesy of brickartist.com. Sheila: What have you have learned from playing with LEGO? Nathan: There are no limits in life! Before I was a full time artist, I was working as a corporate attorney in New York City. By using LEGO as an art medium and creating my own art exhibition, The Art of the Brick, I was able to walk away from being a lawyer and become a full time artist. Now I get to travel the world displaying my an in all parts of the globe. Who would have imagined that LEGO would have taken me to so many places like Taiwan, Australia, Sinapore, Belgium, China, South Africa and many, many more? Sheila: Do you have any advice for aspiring LEGO creators? Nathan: Follow your dreams and you can be whatever you can imagine. Just like there are no limits to LEGO, there are no limits in life. If you work hard, you can create anything you can imagine. I once spent an entire summer creating an entire dinosaur skeleton that measures over 20 feet long. It took a lot of time, but it was worth it in the end. So aspiring LEGO creators need to have patience. When I was working on the dinosaur skeleton there were times when I got frustrated and wanted to give up, but I persevered. Remember to work hard. and don‘t give up. Nathan Sawaya working in studio. Photo courtesy of brickartist.com. A big thanks to Nathan for taking time out of his busy schedule to answer questions about his experiences with LEGO and how boys can learn from LEGO. I especially enjoyed his comment . . .
You can find Nathan at BrickArtist.com and on Facebook, and Pinterest. There are a lot of interesting sculptures to see. Nathan also started a nonprofit organization called “Art Revolution” which is designed to put art back into everyday lives. He says that “art is not optional, it is necessary” and I couldn’t agree more. Take a look at what Nathan is doing and come back and let us know which of Nathan’s pieces your boy liked the best. If you enjoyed this interview please use the sharing buttons below! Let me know what other LEGO artists you would like me to interview–does your boy have a favorite? Leave a comment below.